UPDATE, 11/29: ODOT just sent out an email with more details on the forthcoming EA report. Snark noted, but seriously, who better to get involved? Young people are going to have more of their life to live with the results of this decision. Portland could have a safer and more reliable I-5, a better connected community and opportunities for economic growth without dumping half a billion into extra freeway lanes. It’s not half a billion dollars for freeway lanes. If they were just expanding the freeway and eliminating the overcrossings, it would be lots cheaper. A substantial portion (maybe even more than half) is would be expended on making all the surface streets better for bicyclists, walkers, and non-freeway traffic. I dislike how the land use and transportation systems have evolved into what we have today. I don’t like the fact that so many people live so far from their jobs; that so many people rely on the single-occupant auto; and that so much area is devoted to parking. However, I don’t think that refusing to expand bottlenecks in the freeway system will solve those problems. I know we can’t build our way out of congestion, but my experience commuting by bike from SE Portland to Vancouver showed me that when congestion occurred due to crashes on I-5, that caused motorists to divert to my bike routes on Williams and Interstate. I already see the same diversion to local residential streets and neighborhood greenways from congested arterials and collectors. My solution: higher gas taxes or carbon taxes to reduce travel demand; not arbitrarily forcing traffic onto lower classification streets by refusing to consider every project that expands capacity for autos. Let the flames begin. I guess it’s good to see that ODOT’s propaganda marketing is working. Impose the higher gas taxes and carbon taxes before, and to pay for, that expanded capacity and you might have something. Until then, I will oppose everything that still provides induced demand at little to no cost to those that are filling it in. Good ideas! I think the approach here has been flawed from the beginning. The process should be: we would like to spend half a billion on improving this area, what are the options? Then come up with a couple of options, and rate them on a number of factors. Instead, ODOT went ahead with this design, and it only allows us to either support or oppose it. In such a scenario, the opposition faces an uphill battle because they cannot support a better alternative use of the money; either you use the money for this specific project (and “do something”) or it is gone. Ted Wheeler, with his public policy degree, should know this — public policy 101 posits that we should start with a number of alternatives and then figure out then one that gives us the best bang for the buck. Figuring that out can be difficult and treacherous, but it is better than just moving ahead with one option; this is obviously not how we use resources efficiently. So he should oppose this project on purely procedural grounds, but that would be a highly unpopular position to take. In addition, I think all urban freeways should be tolled like they do in Japan. Adjust the tolls on a 5 minute interval to ensure that no congestion occurs, and all proceeds over and above the freeway maintenance costs shall go toward public transit and cycling infrastructure to provide safe, high quality alternatives for those who can no longer afford to drive alone on a congested freeway. If you want fewer crashes, close some on-ramps. Build a two-lane bridge to Hayden Island and close those exits. Pay the outlet mall stores to go away. Are we up to $200 million yet? I’m pretty sure that would clear up a lot of traffic congestion and use a lot less concrete. Remember the part about concrete sucking up a lot of resources? It’s pretty astounding that ODOT produced a half billion dollar design and didn’t find a way to funnel transit into an HOV lane. Maybe they’ve never been to Seattle. If this design had that feature I’d be tempted to support it. Nope, nope, and still nope. Keep in mind this project doesn’t involve Hayden Island. Since the project also doesn’t involve adding additional lanes to the existing two there is no lane available to funnel HOV traffic. Given the two lanes in play and the short distance within the project scope, I don’t understand how the HOV suggestion would work. I don’t drive much through Seattle, so perhaps I’ve missed the feature ODOT should go see that is applicable to this project. Your statements are correct far as they go. I’m saying, this is what we are offered for a half billion* dollars of our money? It’s a localized solution for a systemic problem. The extra congestion from construction will probably exceed any short-term relief after completion (and there will be crashes that result from that congestion). It will use a lot of resources in an attempt to speed traffic through what is seen as a chokepoint to get to: Many other chokepoints between the Going St. exit and Mill Plain, across the river in Vancouver. It’s a band-aid, a really expensive resource-sucking bandaid. 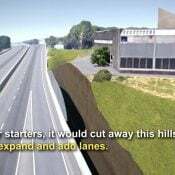 It does nothing to reduce the friction in the system caused by all the vehicles trying to enter and leave the freeway at many different ramps. It does nothing to free up transit routes that use this route for longer distance travel between city centers, each of them carrying dozens of passengers in the road space taken up by two or three single passenger vehicles. *The current estimate. There’s been a $50 million bump already. That is total spin from ODOT/PBOT. The ONLY reason they are building those lids is because they are required for staging areas for construction. This project is only about freeway widening and it is very pared down. If they were designing those lids to provide urban design benefits, they would cost a lot more and they would look totally different. 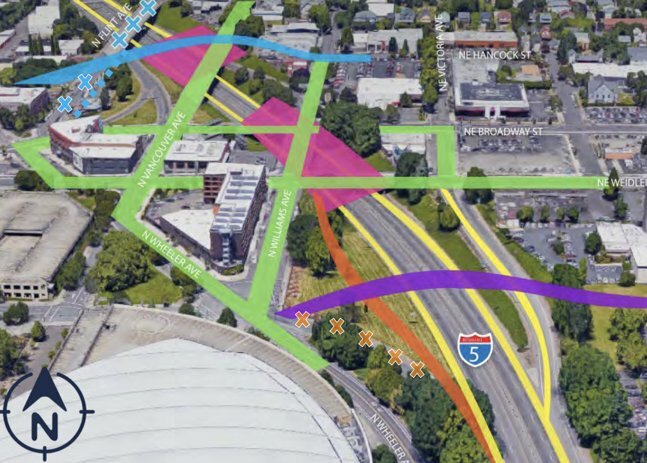 Please do not be deceived by the spin: ODOT has designed an extremely minimal project and then overlaid some bike/ped stuff plus some greenwashing (which will not be green because no one will provide the irrigation required to keep anything alive on a concrete deck). The only additional bike/ped expense is the stand alone bike/ped bridge which is not super useful in its location, is very steep (not very accessible) and will cost no where near half of the budget. The rest of bike ped “improvements” are largely paint. How about diversion on greenways to dump the diverted-by-choice back onto the arterials? That sounds like a completely made up and unfounded assumption. We are going to need a source for that one. In part, due to the singular history of this area of Portland being repeatedly destroyed for “greater good” projects, and that it just happens to be the original heart of the historic African American community that was selected for destruction, these are no small things to be considered. Additionally, these projects have been failed promises to all the people of Portland, leaving this great area of close-in land moribund for decades after cutting it off with freeways and the walled fortress of the Rose Quarter. These are environmental, cultural, historic, and socioeconomic injustices that need to be righted. 2. TRANSPORTATION (read: expanding I-5, plus surface street changes) was only half of the Central City 2035 N/NE Quadrant Plan that was adopted by City Council, BPS, OTC, etc., in 2012. The other half was LAND USE (read: for example, Albina Vision). 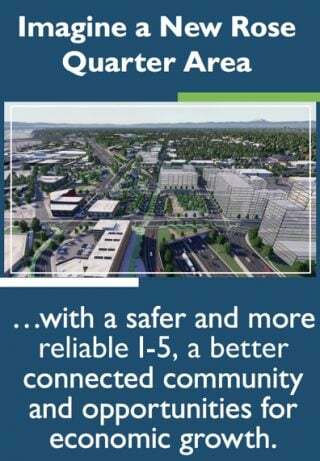 Only the transportation portion has received funding and is what constitutes this I-5 Rose Quarter Project. 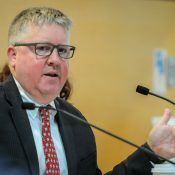 Where is the City and State land use funding? Is this all up to private investors, social programs, and philanthropy? If the transportation portion is just “being done first”, then at a minimum the EA must look at whether or not it is compatible with appropriate land use planning. Currently the design is not. The EA should be legally challenged on this point alone, unless they make some quick changes that show they are designing a transportation system that supports, rather than fights with, the redevelopment of this area. 3. Because the design is not yet set, the EA is required to be done on the “worst case scenario” of the plan. Make sure that is what you base your comments on. 4. Only those who file comments during the open time window will have legal standing to appeal. Many affected groups, organizations, institutions, businesses, residents, property owners, etc., will need more than 30 days to review a document that is currently 150 pages and counting. Some will need to hire professional help to decipher it. It would seem that the short comment period itself is already an unacceptable aspect of the environmental impact of the project on socioeconomic and environmental justice. 5. If you’re not a fan of freeway expansion and plan only to make comments to shut the whole project down, please consider that you may be forfeiting your opportunity to help shape our city. Please also give your comments on the details of the project in case it does go through. I realized that my point 5 above wasn’t clear and I could be misunderstood. Let me try again. 5. 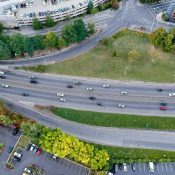 If you, like me, are not a fan of freeway expansion, you may be planning to make comments that are only intended to shut the whole project down. Please consider that you may be forfeiting your opportunity to help shape our city in case it does get built. Please give additional comments on some of these other details that you also care about. Thank you, everyone, for all that you do for our city. Thank you for your excellent suggestions. Comment of the week! This is what it looks like to be steamrolled. I hope the project is terminated, but I’m not optimistic. Tubman Middle School should be relocated due to all the health issues associated with living near a freeway that kids are especially susceptible to. I’d be surprised if the kids going to that school didn’t have 2-3 times the normal rate of ADHD and asthma. Portland has turned a number of schools into drinking establishments and yet we send our children to that health hazard of a school? They’re poor kids. Not that much of a concern for terminally hip Portland. Unfair assessment. The state is at fault here. The state is at fault, but the city supports the plan. And the most enthusiastic supporter of this 0.5 billion dollar plan on city council was endorsed by bike walk vote and by many, if not, most bike advocates. It’s also fascinating to see bike advocates express shock at Chloe Eudaly’s incredibly strong support for transportation alternatives even though many advocates fervently opposed her candidacy (and sometimes in an ugly ad hominem fashion). Tubman school has daily traffic jams from parents DRIVING their kids to and from school. Hard to feel sympathetic about air quality. I’m more horrified by how they figure that whole fiasco deserves a price tag of almost half a billion. Is that in Pesos or Iraqi Dinar? Oh, my bad. They’re actually using the dollar bills for the construction materials. Tillamook is the greenway, not Hanckcock. 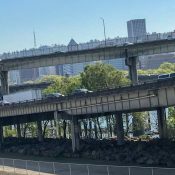 I honestly can’t see any reason to waste $$ on tearing down the Flint overpass (which safely & easily connects from Tillamook to B’Way)… only to then build another overpass at Hancock… which doesn’t connect to the greenway… and yet ends at (basicaly) the same place. I mean… really– why?? There’s nothing wrong with Flint. Why waste the cash? City planners have been buttF$%^#ing themselves over this thing for years now– ever since moneyed interests ruined WIlliams/ Vancouver as a viable N-S bike route– and still have yet to arrive at a sensible solution for this boondoggle they’ve created entirely out of their own shortsightedness. The only reason they need to tear down Flint (along with Williams, Vancouver, Broadway, Weidler bridges) is to expand the footprint of the freeway. I agree, it is a tremendous waste of existing resources. Those bridges have plenty of service life left in them. During the process ODOT refused to consider alternatives that did not involve the costly destruction and rebuild of these structures. One of my favorite things to do: drink a glass of beer and watch all of the people using the Williams/Vancouver bikeway. Are we still on that? It’s not perfect but people on bikes are finding their way through it in droves. At peak hours it can carry more people on bikes than in cars. Mode share? It’s already happening on Williams and Vancouver. This boondoggle is nothing more than a giveaway to the trucking and construction industry disguised to look as if they are doing something for the common person and in reality, will only increase pollution in the area and do nothing substantial for driving. Driving, in essence, is the least efficient mode of transportation. There already exists today ample infra for biking and walking and only needs to be enhanced. But..ODOT is pretty good at only writing checks.